Discover the natural beauty of the Northern Lights on this tour with stays in Whitehorse & Boreale Ranch enjoying this spectacular light show at your own pace. Welcome to Whitehorse! The Yukon capital is a small but interesting city set on a beautiful river with a backdrop of mountains. Yukon gold rush history is around every corner and it is a perfect place to wander. You will be met at Whitehorse airport and transferred to your downtown hotel. In the late evening you will be picked up and transferred to an Aurora viewing camp just outside of Whitehorse. A cosy cabin or heated tent with hot drinks and snacks await. Experts will be on hand to help you learn about the Aurora and assist with photography. Spend your night gazing upwards in anticipation of the dazzling display of light that dances across the sky. After a sleep in, be taken on a tour of Whitehorse and the surrounds. In the early afternoon, transfer out to your chosen aurora wilderness lodge. Both Boreale Ranch and Northern Lights Resort are deluxe lodges with rustic Yukon character located in dramatic settings, perfect for aurora viewing. Relax and unwind, enjoy the peaceful surroundings of mountains, rivers and forest. With wide open spaces at your door it allows for unobstructed views and enhances your chance of catching the lights. After a delicious dinner, find a comfortable spot where you can see the sky and wait for the light show to begin. Watch the dancing from either the open field, from the comfort of the lodge, or from the hot tub. Regardless of where you choose, you will have a great outlook towards the north where the lights appear. Take advantage of the pristine and tranquil setting by doing as much or as little as you please. Your comfortable lodge is a unique retreat where you can appreciate the wonderful surrounds. Have a soak in the hot tub, relax in the lounge or on the deck, or if you’re feeling more energetic, take one of the many activities on offer such as a fun dog sled ride or an adventurous snow shoe expedition (own expense). After another delicious dinner settle back in for another night of aurora viewing. Turn your gaze skyward and wait for this mystical event to unfold before your eyes where vibrant colours skip across the sky in waves, blankets, flickers and curtains. Watch in amazement as you stare in disbelief and excitement of this wondrous event of nature. 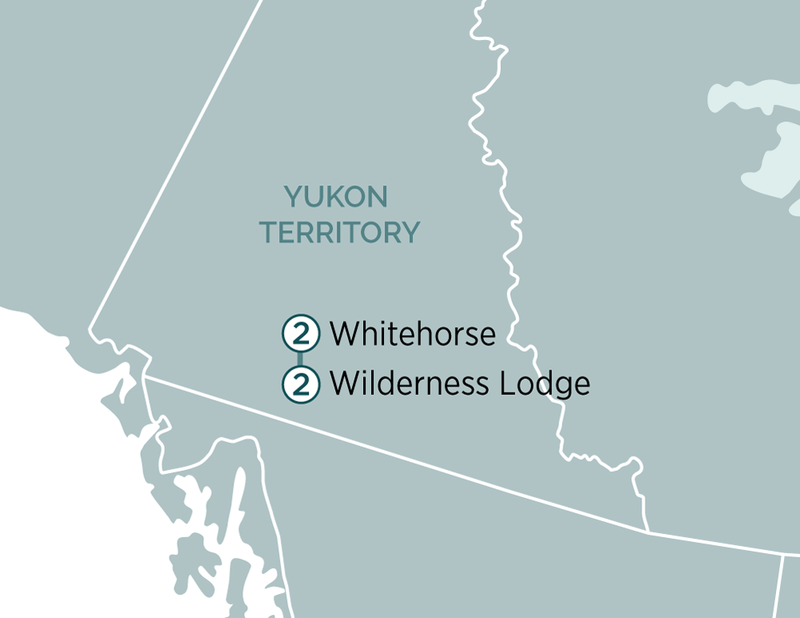 Reluctantly depart your piece of natural paradise and return to Whitehorse. Spend the day as you wish before being taken out for one last chance at viewing the Northern Lights. Head out to the Northern Tales Trading post and enjoy the cosy atmosphere, sipping on a hot drink while once again waiting in anticipation of nature’s great spectacle. Your Yukon and Northern Lights adventure comes to an end today as you bid farewell to Whitehorse. Transfer to Whitehorse airport for your onward flight. Note: This is an independent package that is not escorted by an Evergreen tour director. Due to the nocturnal and seasonal nature of this package, professional cold weather clothing is necessary. If you don’t have your own, a winter clothing package is available at additional cost. Please enquire for details. Optional excursions are not included in the package price and are at additional expense.